Tottenham beat Manchester United to a place in next season's Europa League after an easy win over Aston Villa. Paulinho cut through the heart of the Villa defence to shoot past Brad Guzan to put Spurs in early control. Nathan Baker headed Danny Rose's cross past his own goalkeeper before Emmanuel Adebayor scored from the spot. Spurs finished the season in sixth place, three points shy of their total last term, in what could be boss Tim Sherwood's last game in charge. Despite finishing five points clear of Manchester United, uncertainty surrounds Sherwood's future as the club has been linked with several replacements for next season. That search comes after Spurs failed to make the Champions League following huge investment last summer and a season where Sherwood appeared to occasionally fall out with his players. Sherwood has likened his status to that of a "supply teacher", enhanced by claims from midfielder Sandro this week that his manager would depart in the summer. Yet with the Brazilian player in the starting line-up, Spurs did not look like a side with a lack of respect for their manager, as Sherwood had stated, and the game was as good as over by half-time with all the goals coming before the break. The result did little to enhance the prospects of Villa manager Paul Lambert, who also faces uncertainty after another inconsistent season where his side finished 15th, five points above the drop zone. Villa only secured their Premier League status with two games left and with American owner Randy Lerner set to make an announcement about his role in the club, both clubs could be set for a summer of upheaval. It took 20 minutes before Villa threatened the hosts' goal and by that stage they could have been three goals behind. Tim Sherwood on inviting a Spurs fan into the dugout. "He is the proper manager, so it was his chance to have a go. It's only friendly banter." Harry Kane had twice gone close before Paulinho opened the scoring after 14 minutes. The Brazilian, who unlike compatriot Sandro has been selected in his national team's World Cup squad, strode through the Villa defence and collected Gylfi Sigursson's pass before beating Guzan at a second attempt. Shorn of the injured Christian Benteke, Villa lacked any purpose going forward and they went further behind when Baker headed into his own net. It got worse before the interval. After a corner was cleared, Sandro's shot caught Gabriel Agbonlahor's arm and referee Jonathan Moss had no hesitation in pointing to the spot. Adebayor dispatched his kick from 12 yards for his 14th goal of the season. The second half was a damp squib in comparison but in a rare moment of action Fabian Delph fired wide after 57 minutes following Villa's best move of the match. Sherwood and Sandro exchanged a friendly hug after the midfielder was substituted and there was a scare for American goalkeeper Guzan after a collision with Kane. Whether Sherwood will be smiling when his future is discussed with chairman Daniel Levy remains to be seen. "If it is to be my last game, life goes on. There were no tears shed out there on the lap of honour. "This club means a lot to me but if I'm not to continue here as manager I'll be somewhere else. "I've got a 59 per cent win ratio in the Premier League and I think if I had started the season in charge we'd be in the Champions League,"
"[The negative reaction of fans] is never nice because the lads have given everything in their body to avoid relegation and get over the line. "Supporters come a long, long way and pay good money to watch and try to see their team win. You've got to be big enough to take it. "They're a young group of players as it is and it'll probably affect even the experienced ones." 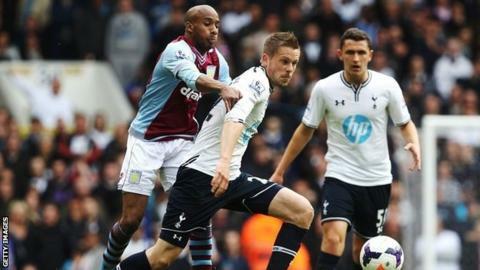 Match ends, Tottenham Hotspur 3, Aston Villa 0. Second Half ends, Tottenham Hotspur 3, Aston Villa 0. Fabian Delph (Aston Villa) wins a free kick on the right wing. Substitution, Tottenham Hotspur. Alex Pritchard replaces Gylfi Sigurdsson. Substitution, Aston Villa. Callum Robinson replaces Leandro Bacuna. Gylfi Sigurdsson (Tottenham Hotspur) wins a free kick on the right wing. Attempt saved. Fabian Delph (Aston Villa) left footed shot from outside the box is saved in the bottom left corner. Assisted by Andreas Weimann. Offside, Tottenham Hotspur. Kyle Naughton tries a through ball, but Emmanuel Adebayor is caught offside. Attempt missed. Nabil Bentaleb (Tottenham Hotspur) left footed shot from outside the box misses to the right. Assisted by Milos Veljkovic. Emmanuel Adebayor (Tottenham Hotspur) wins a free kick in the defensive half. Substitution, Tottenham Hotspur. Nabil Bentaleb replaces Paulinho. Offside, Tottenham Hotspur. Paulinho tries a through ball, but Emmanuel Adebayor is caught offside. Kyle Naughton (Tottenham Hotspur) is shown the yellow card for a bad foul. Foul by Kyle Naughton (Tottenham Hotspur). Andreas Weimann (Aston Villa) wins a free kick on the left wing. Delay in match Brad Guzan (Aston Villa) because of an injury. Offside, Tottenham Hotspur. Kyle Naughton tries a through ball, but Harry Kane is caught offside. Substitution, Tottenham Hotspur. Milos Veljkovic replaces Sandro. Offside, Tottenham Hotspur. Vlad Chiriches tries a through ball, but Emmanuel Adebayor is caught offside. Gabriel Agbonlahor (Aston Villa) wins a free kick on the left wing. Attempt missed. Fabian Delph (Aston Villa) left footed shot from outside the box is close, but misses to the left. Assisted by Gabriel Agbonlahor with a headed pass. Gylfi Sigurdsson (Tottenham Hotspur) wins a free kick in the defensive half. Leandro Bacuna (Aston Villa) wins a free kick in the defensive half.